The San Francisco 49ers sent shockwaves through the NFL last month when they traded a second-round pick to land quarterback Jimmy Garoppolo from the New England Patriots. Having long since been considered Tom Brady’s heir apparent, Garoppolo is now the quarterback of the future in San Francisco. San Francisco fans got their first glimpse of what they can expect from Garoppolo when he came on late in relief of rookie C.J. Beathard in the Week 12 loss to the Seattle Seahawks, converting a fourth down before throwing a last-second touchdown pass. His cameo was in keeping with what he produced in two starts for the Patriots last season when Tom Brady was suspended, and he will make his first start for the 49ers this Sunday when they take on the Chicago Bears. Here we look at what Niners fans can expect from Garoppolo in our latest deep dive. What stood out about Garoppolo during his limited game action for the Patriots last year was his poise. Neither of the games against the Arizona Cardinals and the Miami Dolphins appeared too big for him, and he delivered his throws with confidence and accuracy, showing impressive anticipation and leading his receivers to the ball, which he did on each of these passes to Julian Edelman and Chris Hogan, the latter effort also showcasing Garoppolo’s arm as he connected on a throw from the far hashmark towards the opposite sideline with little difficulty. The arm strength is also to Garoppolo’s advantage when he attempts passes into tight windows. Garoppolo has displayed an ability to put significant zip on the ball, and that was to his benefit on this throw, on which he was able to gun the ball into the receiver before either of the two converging defenders could make a play on it. As alluded to earlier, Garoppolo exuded composure when on the field for the Patriots in 2016, and that was evident in his play in the pocket. Garoppolo consistently demonstrated the ability to nullify pressure with his movement and was able to do significant damage against the Dolphins as a result. On both of the below plays, Garoppolo calmly steps up to avoid pressure from the edges, delivering a short throw that went for a touchdown to Danny Amendola and a deep completion to Chris Hogan. That same pocket presence and poise under pressure was on show as he threw his first 49ers touchdown pass. With time expiring, Garoppolo avoided the rush and rolled out to his right before resetting and delivering a perfectly timed throw to Louis Murphy in the endzone. Garoppolo had already been in the league two years when he took over for the suspended Brady, but the way in which he stayed calm in the pocket and manipulated defenses was still extremely impressive for a player of his limited experience. Among his best throws was this downfield effort against the Cardinals, where he twice utilises the pump fake to get the defense to hesitate and engineer space for Amendola, before rolling slightly to his left to make the throw easier and hitting his receiver for a substantial gain. He followed that up with another excellent example of manipulation, this time using his eyes by looking one way to force the deep safety to move towards his right, putting him completely out of position as Garoppolo quickly changed his course and hit the streaking tight end with a perfect throw down the seam for a touchdown. While he is far from a dual-threat quarterback, Garoppolo has enough mobility to be able to frustrate defenses and make plays on the run. His longest run against the Cardinals saw him escape the pocket and pick up a 10-yard gain while, in the Dolphins game, Garoppolo was able to regularly make throws on the move, with the first example seeing him hit Hogan in stride before he connected with Amendola for a touchdown later in the game, again putting his arm strength on display as he was able to complete an on-target throw off his back foot. Garoppolo’s mobility will allow 49ers head coach and play-caller Kyle Shanahan to make use of plenty of play-action, rollouts and zone-read plays, However, a coach seen as one of the best at working with quarterbacks in the NFL will have a number of issues to iron out if he is to make a success of his newest acquisition in San Francisco. Garoppolo can throw with touch and accuracy when pushing the ball downfield, as his touchdown throw to Chris Hogan in the 2016 opener with the Cardinals demonstrated. However, the problem for him when going deep has been consistency. Indeed, while his performance against the Dolphins was largely excellent, it was also marked by a pair of overthrows on deep balls, both of which could have gone for touchdowns had they been thrown accurately to the wideout. Garoppolo’s occasional inaccuracies extend beyond deep passes. He does have an irritating tendency to miss intermediate-level throws. His most common deficiency in that regard is to miss high which, as with many inaccurate throws, stems from lazy footwork. While his fundamentals are generally sound, Garoppolo will often fail to fully transfer his weight into throws, as was the case on both the below instances from the Cardinals game where his throws were too high for his intended receiver. Though for the most part Garoppolo is a decisive quarterback, there are also occasions where he will hold on to the ball too long, as he did on this play versus Arizona, failing to sense the pressure from the free rusher up the middle and clinging on to the ball instead of looking to find the receiver coming free on the crossing route or making a move to escape the pocket. Garoppolo, like all quarterbacks, has his deficiencies, but he is a signal-caller whose composure and confidence in how he sets about dissecting defenses is indicative of a quarterback who has spent all of his pro career learning from arguably the best coach and quarterback combination of all time in Bill Belichick and Brady. He has the arm talent to make all the throws, the poise to deal with pressure and the intelligence to make defenses second guess what he is going to do and pick them apart with the movement of his eyes. Combine these qualities with the ability to make plays on the ground, and you have a quarterback with the skill set to flourish under Shanahan. 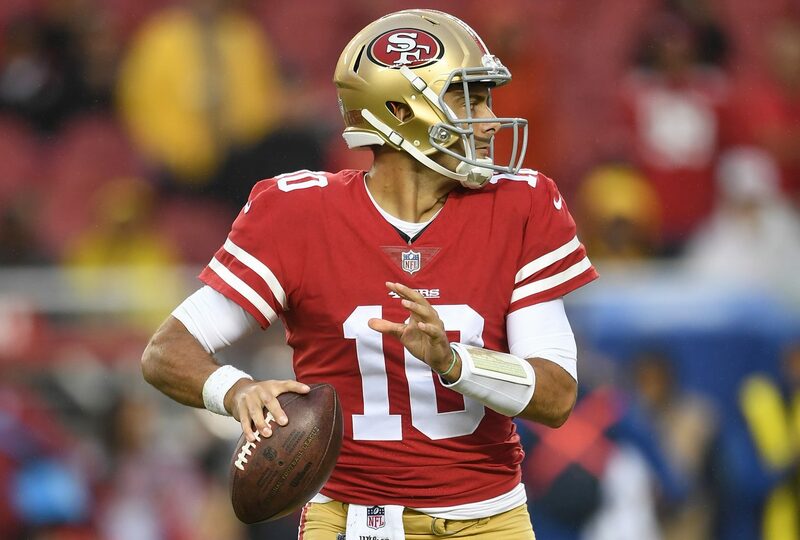 Garoppolo may only have two starts to his name, but the tape indicates the 49ers were right to give up draft capital to acquire a player of his massive potential. They will get the first clue as to whether their decision was correct this weekend.